Sunday, March 30th, 2015, a small group of people gathered at the Kingman AZ Veterans Memorial Park to commemorate the 50th Anniversary of Vietnam War and honor those who served. I got there late because of work, but got the opportunity to go around and shake hands with some of the Vets there, and say to them that I appreciate their service. Every last one of them took time to tell me how much that meant to them. I was in high school when Vietnam broke loose. I had classmates who served. I had three cousins who served. One had 3 tours in Nam, and Lew, George and Skip – I’ve never taken the time to tell you how proud I am of each of you and how much I appreciate your service. I still have your Service photos! When someone asked me today for my impressions of yesterday’s event, I shared with him that i have vivid memories of the protests, and the turbulence of the time. 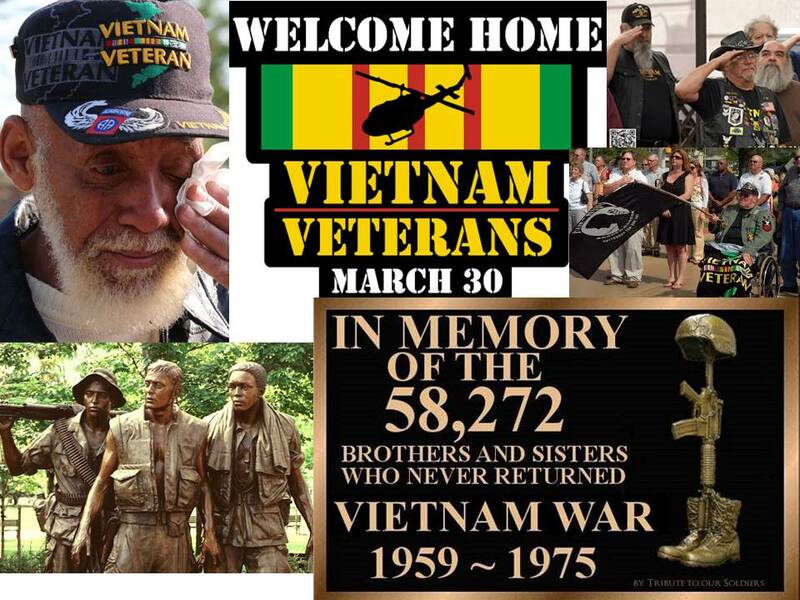 But most importantly, I carry with me the deep regret that the men and women who served in Vietnam were not given a heroes welcome – many were spat on as they returned. They were made the scapegoats and treated like criminals. We can’t change that part of our history, but we can heal it, and help them to heal by expressing our appreciation to them today. They deserve closure. They deserve acknowledgement for their sacrifice. Many still carry the psychological wounds of what they witnessed over there, and what they experienced back here. Whether or not I may agree or disagree with the reasons for being there, I know this. Most of our young people serve out of a sense duty, a desire to protect, to defend. They buy the image on posters with the perfect dress uniforms. (Maybe we should have posters with blood-stained fatigues and missing body parts.) They learn to follow orders, going where they are told and doing what they believe they must do. The point is this – today when I encounter a person in uniform or a veteran, especially a Vietnam Vets, I make it a point to approach them, stick out my hand and express appreciation for their service. In almost every instance, they a touched and grateful for the acknowledgement. There’s a lot of “walking wounded” (no pun intended) still out there and we have the ability to help them heal.